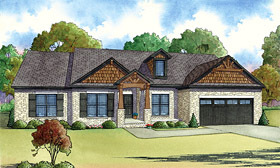 This traditional style home is featured in the exclusive MEN Collection by award winning designer Michael E. Nelson. The rustic exterior featuring stone and timber columns on the covered front porch creates wonderful curb appeal. Inside you will find an open floor plan with a split bedroom design. Entertaining or family gatherings are done with ease in the open great room that flows easily into the spacious kitchen that features a curved eat-at bar. The master suite is located on the right side of the home offering privacy for the homeowner. Spacious his and hers closets and access to the rear covered porch are also featured in the master suite. Bedrooms 2, 3, and 4 are on the opposite side of the home with a spacious hall bath.